Sunday February 10, 2019-Former Vice President, Kalonzo Musyoka, has said the looming referendum is unstoppable and all Kenyans must support the exercise. Speaking in Machakos County during the meeting of all Ukambani leaders on Friday, Kalonzo said there is general consensus among opposition political parties to team up with President Uhuru Kenyatta to oversee the review exercise. Kalonzo, who is also Wiper Democratic Movement party leader, is rooting for an expanded Executive in the Constitutional review process. “But now we have found a solution and the solution is our preparedness to amend our Constitution and to make this country once and for all an all inclusive State,” Kalonzo said. He also said he is ready to support Uhuru for a third term in office if constitution allows him. “Tuungane, with other communities, tumsaidie ndugu Uhuru Muigai Kenyatta. Kama atasema after the new Constitution tumeiunda na mimi nataka kuendelea mbele ntamwambia nitakusupport (Let’s come together with other communities and help our brother Uhuru Muigai Kenyatta. If he says after the new Constitution that he wants to proceed I will support him)," Kalonzo said. 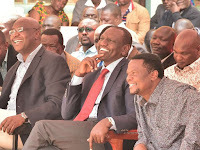 But Kalonzo’s choice of words have been criticised by Deputy President William Ruto’s allies who said President Kenyatta’s tenure ends in 2022. “The constitution allows the president to vie for two terms , so somebody suggesting Uhuru to serve for 3 terms is mad and should be taken to a mental hospital,” said Sirisia MP , John Waluke. Waluke is a close ally of Deputy President.